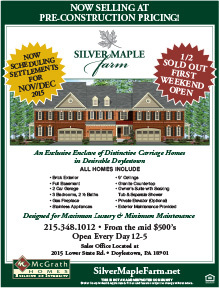 Newtown, Bucks County - QUICK DELIVERY HOMES AVAILABLE! Each ranch style villa is tremendously appealing. Your home will include elegant designer interiors with state-of-the-art kitchens, volume ceilings, luxurious bedrooms and baths, a second floor finished loft or guest bedroom, energy efficient, clean, economical gas heat, and an oversized two-car garage with direct access into your home. Graceful oversized and circle-top windows bring in abundant natural light. Dramatic, open designs accommodate formal or informal entertaining… Patios or decks bring out the best in a summer’s evening… Luxurious owner suites pamper you stylishly, at the end of every day. McGrath Homes uses the finest national brand names in the construction and outfitting of these homes, providing enduring quality and value. Each day the clubhouse serves as the center of community life as residents enjoy The Villas of Newtown resort lifestyle. The possibilities for recreation and leisure are virtually endless. The fabulous amenities extend outdoors onto a furnished veranda surrounded by lush landscaping. Lounge around the lovely naturally contoured outdoor pool or play a game of tennis, basketball or volleyball. Nothing can top meeting friends for an evening walk or to simply relax, talk, and enjoy the beautiful setting. Imagine a birthday party for one of your grandchildren at the picnic area adjoining the clubhouse. Picture an invigorating set of tennis in the cool of the morning to start your day. In addition, lawn care and snow removal is taken care of, allowing residents to spend even more time enjoying the activities they love. Many residents enjoy second homes in warmer states like Arizona and Florida or head to the Jersey Shore in the summer, and experience the freedom their virtually maintenance free home provides. Enjoy the close proximity to dining and shopping at the Newtown boutiques and antique shops in New Hope and Peddler’s Village!